What is the scenario to be played in Round 2? Opened with a Cavalry charge, which did some good. Aside from one fantastic roll of 4 CAV on 7 dice, which eliminated a French Cuirassier, Stan wasn't getting any joy. In the end I exited two LC, eliminate two Austrian cavalry, and finally stalked a Austrian Line, and got lucky with a 2d Leader check. Opened with a Cavalry charge, French charged back and I counterattacked, so it was all cavalry. Austrians were the winner with French French cavalry lost for 1 Austrian HC (and 3/4 of the Austrian LC). 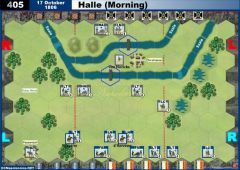 Austrian Grenzers bombarded in square for the other loss, but after that it was just waiting for the French move and concentrating on 1 unit for the win. Last edit: 6 months 5 days ago by Mark-McG. 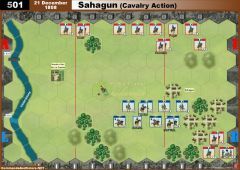 An early, tentative advance by the Austrian Heavy cavalry provoked a prompt riposte from their French counter-parts and from then on cavalry were involved in much of the action. 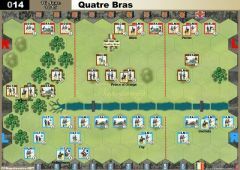 French cavalry gained the upper hand with the elimination of the Austrian Heavies, a leader kill putting additional pressure on the Austrians. Yet, the core of the Austrian infantry held firm and the unsupported French cavalry retreated for a time. A brief foray by the Austrian infantry made an impression but was ultimately repulsed with no units lost. 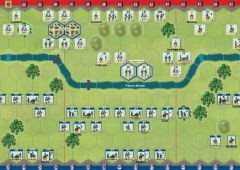 A Rally then restored the French left and gave Light Cavalry units on the right enough strength to risk a charge against the already depleted Austrian Foot Artillery to end the game. 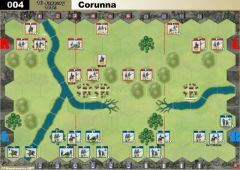 A hard game for the Austrians as it was decided by cavalry. 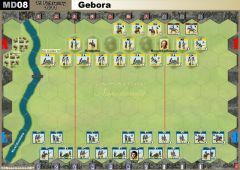 The action opened with the Austrian Right attacked by the French cavalry, with the cavalry ultimately fighting to a standstill for the loss of two banners each. Meanwhile, in the centre, the French built up a strong position for assaulting the Austrian right flank whilst the Austrians retreated (after another exchange of banners), using Garrisons in an attempt to hamper the French advance and eek out their shrinking defences. 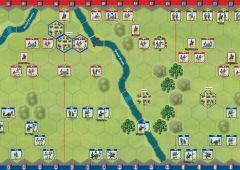 In the final phase, the infantry battle now raged on the Austrian right flank, with infantry units and leaders on each side struggling to gain advantage resulting in a fourth banner exchange. 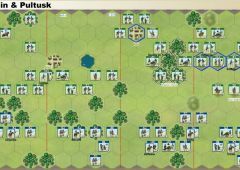 At the same time, the Austrians had not given up on their left, their infantry was intact and was able to push through with an attack leaving its infantry target retreated and down to a single block. 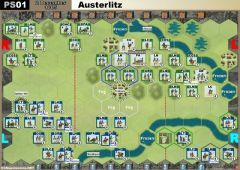 By this point, each side one banner from a win, a two block Austrian Line could have been wiped out but cards and unlucky dice meant it was not to be. 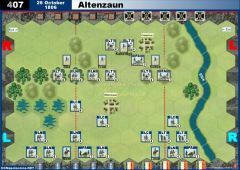 At better odds, the Austrians made their final attack to wipe out the last block of the retreated French line to take the fifth banner. 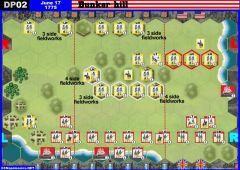 A tense and memorable game with all parts of the battlefield involved. 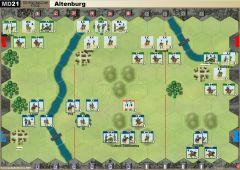 There was a synching error in this game that is apparent in the log file, starting from an Austrian LC move that didn’t get reflected at the French end. Despite fixing this in the game, whenever the A-LC was moved, the log file ignored that, causing a couple of confused moments. The error is apparent from the (correct) placement of markers on blank hexes. Fortunately, the A-LC unit was destroyed soon after. Thanks for Chris for two good games. Last edit: 6 months 5 days ago by RiverWanderer. Reason: removed some white space. The better cards & dice went to Austrians in the 2nd game. Both games were close but Game 1 was decided by the Austrians having about 6 Left Flank card plays where there were no units on the left flank. Gave the French time to recover and come back. seems like not many games played with the deadline drawing close. Please get your matches played by 31 October! This is a tough one for the Austrians, with an army only 2/3 the size of French forces. After some initial skirmishing, my French launched a Cavalry Charge that eventually took out the Austrian HC, at the cost of one of the French LC. Most of the rest of the fighting took place in the center, even though the French never got a Center Section card. However, three Bayonet Charges made up for this deficiency. The first one allowed me to move LN units into position. The second one was used for an actual attack, which quickly eliminated two Austrian LN. Continued fighting saw an exchange of LN units, and the score stood 4-2. Then the third Bayonet Charge allowed the French to exit a unit off the board for the fifth and final banner.